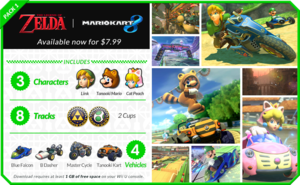 The Legend of Zelda × Mario Kart 8 is one of three downloadable content packs available for Mario Kart 8, the others being Mercedes-Benz × Mario Kart 8 and Animal Crossing × Mario Kart 8. It was released on November 13, 2014. This is the first time retro and nitro courses are combined into cups. An overview of the contents of the pack. Like Animal Crossing × Mario Kart 8, this pack contains three new characters, four new vehicles (3 karts and a bike), a new set of tires, a new glider, and two new cups with four courses each. These characters, once obtained, may appear as computer racers. Additionally, in online races, players that have not purchased the pack can see other players use these characters. All 3 of these characters make their playable debut in the Mario Kart series through this pack. In addition, Tanooki Mario and Cat Peach, despite being forms of their respective base characters, are considered separate from them in this game and take up different locations on the character select screen. Tanooki Mario - Mario powered up by a Super Leaf. This form was first seen in Super Mario Bros. 3. His horn is the cape sound effect from Super Mario World. Cat Peach - Princess Peach powered up by a Super Bell. This form was first seen in Super Mario 3D World. Link - The main protagonist of the The Legend of Zelda series. His appearance is based upon that of his incarnation in The Legend of Zelda: Skyward Sword. Blue Falcon - A kart based on one of many vehicles that appear in the F-Zero series. It previously appeared as an unlockable kart in Mario Kart Wii. B Dasher - A kart that previously appeared in Mario Kart DS and Mario Kart 7, and is Mario's first kart in the former. Master Cycle - A bike based on Epona from the The Legend of Zelda series. Tanooki Kart - A kart that resembles a jeep. The wheel on the back is colored to look like a Tanooki tail and has a small metal Tanooki Leaf in the middle. Triforce Tires - A set of tires based on the The Legend of Zelda series. Hylian Kite - A glider based on the The Legend of Zelda series. This page was last edited on March 27, 2019, at 14:18.